The links are in the homework assignment. 4 different assignments. that first and then the rest is incredibly interesting. Two more assignments on this topic to go. This week was about non-Mendelian inheritance. We had a Mastering Genetics assignment along with a reading and questions about Morgan. Reading below and information about a new movie about Morgan's lab. I have attached the assignment. We also had a million hours of work on the Mastering Genetics site. Mostly probability/math based problems. This week's assignments had to do with Mitosis, Meiosis, and HeLa Cells. There was a Mastering Genetics assignment that mostly had to do with sequencing events of both Mitosis and Meiosis, etc. There was also the two podcasts from Dr. Hardwick that are supported by the two powerpoints. There was also an assignment on Henrietta Lacks. Those questions and the resources are listed below. 1) Who is Henrietta Lacks? 2) Who is George Gey and what is his role in Henrietta’s story? 3) What was discovered about Henrietta’s cells? http://rebeccaskloot.com/the-immortal-life/book-special-features/ You will find the videos about midway down on this page. The narration of the historical video is a bit dry but probably very characteristic for science of the time. But the video is very informative and visually interesting. Part III – Read the pdf “The Immortal Life of Henrietta Lacks, the Sequel, ” by Rebecca Skloot. 1) What is the “sequel” to the original story of Henrietta Lacks? Part IV - Read the pdf “A family Consents to a Medical Gift, 62 Years Later,” by Carl Zimmer. 1) What agreement was reached between the Lacks family and the National Institute of Health (NIH)? 2) What is the scientific significance of this agreement? 3) Why are Henrietta’s cells immortal? 1) Who is Henrietta Lacks? Henrietta Lacks is a black woman who died from an aggressive cervical cancer in 1951. Tissue samples of her tumor and regular cervical cells were taken without her knowledge. Her cancer cells were cultured and began to continuously multiply. Her cells have been used is in labs all over the world. They have been used in the treatment of polio, leukemia, and many other diseases. They have been used in cancer research, cloning, etc. 2) Who is George Gey and what is his role in Henrietta’s story? George Gey was the head of Tissue Culture Research at John Hopkins. He had been trying for years to grow malignant cells outside of the body. He was looking for a continuously dividing cell line. Henrietta’s cells were sent to his lab and began to grow. He sent Henrietta’s cells to any Cancer Research Scientist that requested them. 3) What was discovered about Henrietta’s cells? Henrietta’s cells stayed alive in culture and supplied researchers with a continuously dividing line of cells. 1) What is the “sequel” to the original story of Henrietta Lacks? The sequel to the original story is a continuation of lack of consent and patient privacy. The HeLa genome was sequenced and published publicly. It followed regulations over thirty years old. 1) What agreement was reached between the Lacks family and the National Institute of Health (NIH)? The data is to be stored in the NIH’s database of genotypes and phenotypes. Applications will be reviewed by a committee in which two Lacks family member are included are required by researchers and annual reports must be submitted. The Lack’s family will not benefit financially from any new products. 2) What is the scientific significance of this agreement? Cancer genomes are required for further cancer research. Families must be able to trust the research process. These steps help ensure future genomic information contributions are respected. the line of Henrietta’s cells have never died off, they are considered immortal. semiconservative methods and Meselson-Stahl experimentation. We had Mastering Genetics work with the above plus some work on telomeres. The following link is about the discovery of telomerase. My teacher has been sick for weeks so the class is moving very slowly right now. This week we worked on the discovery of DNA and the structure. Here is the powerpoint she shared with us. There was a lot of emphasis on the early studies of Griffith, Avery, MacLeod, and McCarty and Hershey and Chase. We had a Mastering Genetics online assignment which was mainly about the structure of DNA and the experiments above. 1. a. How were scientists able to determine that DNA, and not some other molecule, serves as the genetic material in bacteria and bacteriophages? Griffith’s experiment concluded that some material was being exchanged. But what was it? Protein? Nucleic Acid? Avery, MacLeod, and McCarty through experimentation, concluded it was DNA. After removing proteins, polysaccharides, contaminates and RNA, transformation was still occurring. Yet it did not occur when DNA was removed with DNase. It was also concluded that not only was DNA responsible, but it was heritable. Hershey and Chase confirmed with radioactive Phosphorus in DNA. b. How do we know that DNA also serves as the genetic material in eukaryotes such as humans? There was indirect evidence that eukaryotes have DNA as the genetic material because DNA was in the nucleus. Chromosomes were in the nucleus. Proteins were everywhere. More indirect evidence was the ability to cause mutations in the DNA with UV light waves. Today we have direct proof with recombinant DNA. 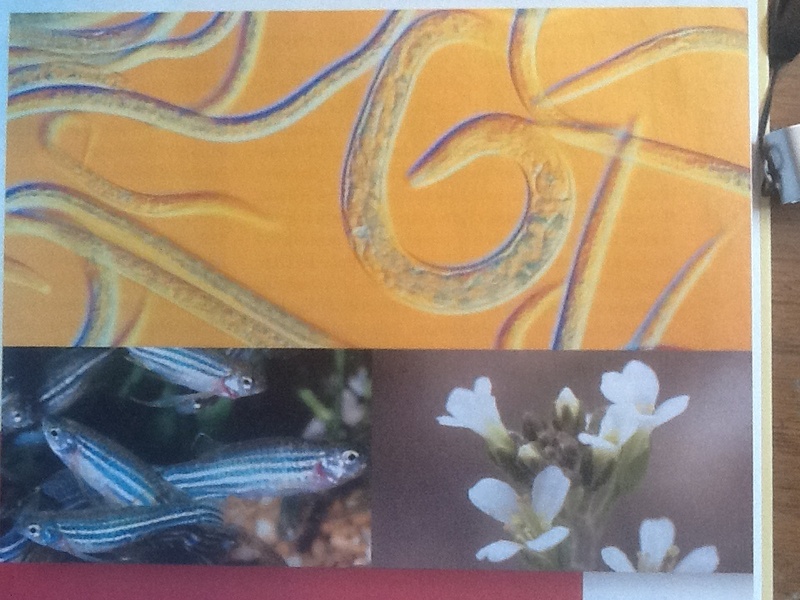 Genes can be introduced into other organisms DNA and produce new proteins. c. How was it determined that the structure of DNA is a double helix with the two strands held together by hydrogen bonds formed between nitrogenous bases? The x-ray diffraction photo from Rosalind Franklin was key to determining that DNA was a double helix. Chargaff’s base-composition studies concluded that the same percentage of As and Ts existed in organisms and the same percentage Cs and Gs. Watson and Crick used the measurements from the x-ray diffraction photo to determine that the pairing was a purine with a pyrimidine. With a model, Watson and Crick determined the connections between the bases with where hydrogen bonds would be possible. d. How do we know that G pairs with C and A pairs with T as complementary base pairs are formed? We know this through Chargaff’s base composition studies and Watson and Crick’s working model. e. How do we know that repetitive DNA sequences exist in eukaryotes? The reassociation rates with the complementary strand in replication are faster in some areas than in others. Multiple copies reassociate faster than single copies. 3. Discuss the reasons proteins were generally favored over DNA as the genetic material before 1940. What was the role of the tetranucleotide hypothesis in this controversy? Proteins were more diverse. There were 20 different amino acids, vs. the 4 nitrogen bases. There were also more proteins available than DNA. The tetranucleotide hypothesis stated the 4 components were repeated over and over. This idea also supported that proteins must be the genetic material. 5. When Avery and his colleagues had obtained what was concluded to be the transforming factor from the IIIS virulent cells, they treated the fraction with proteases, RNase, and DNase, followed in each case by the assay for retention or loss of transforming ability. What were the purpose and results of these experiments? What conclusions were drawn? The outer proteins were removed with a chloroform. The polysaccharides were removed with enzymes. It was then precipitated with ethanol. Transformation was then tested. It was still occurring. This meant the above processes did not remove what was responsible. All of the contaminants were removed. RNA was removed with RNase, enzymes were used to remove any existed proteins. Transformation was tested. It still occurred. Again, the genetic material was not in the products destroyed. Then the DNA was destroyed with DNase. Transformation then did NOT occur. This was proof. DNA was the genetic material involved in transformation. My homework this week involved extensions beyond the book: readings, videos, and animations. If I was teaching a genetics class, I would include all of the following and a time-line assignment with the scientists involved. I went to library today and checked out DNA - The Secret of Life. I think I might like to read the original "Double-Helix" by James Watson and a few other books I found on Rosalind Franklin. One of the great stories in Biology is that of the discovery of DNA. This story is much larger than that of Watson and Crick and includes the great discoveries that lead to that defining moment in the history of DNA. Another reason it makes such a great story is that it so beautifully illuminates the nature and process of science. Before we begin the lectures on DNA, I would like you to spend some time looking at this fascinating chapter in the history of biology. Answer the following questions and submit them to your Box Folder and title: Homework -History of DNA. 2) Many people have been surprised by the fierce competition and the human condition displayed in the race to discover the structure of DNA. Were you? No, I was not surprised to learn of this race for discovery. Why or why not? I had more prior knowledge of the race involved in the Genome Project than the discovery of DNA when I started teaching Biology, so I already understood this race to the top that exists within scientific communities. Although so many were involved, i.e. Chargaff, Watson and Crick, Pauling, Franklin and Wilkins, in the end, the finish line was a culmination of all of their work. 3) Do you think Watson and Crick did “science” in their discovery? Explain. Yes, I do think Watson and Crick’s contribution was science. If you read different explanations to the question “What is Science?’ you will find very similar explanations. My favorite involved “human effort to understand”. A “collection of facts” is science. A “systematic observation” is science. And if you put all the scientists contributions together to find the answer to the structure of DNA, it was in fact a question solved with a system. This system included all of their discoveries, necessary in an algorithmic order. 4) Watson’s book “The Double Helix” is often credited with bringing Rosalind Franklin back into the DNA story. Do you think she would have been lost to history had it not been for this book? I believe Rosalind Franklin’s contribution would have still been recognized in the history of DNA, although probably at a later time in history if not for the book. Why or why not? She had been mentioned in published journals in articles written by Watson and Crick. Her own personal lab notes that are still in the archives at King’s College, along with her published works of the time were no secret. At some point, some journalist with a detective spirit would have revealed her part in this story. And as with anything else, the negativity attracted attention to her story at that time. 5) What is Rosalind Franklin’s role in the story of DNA? 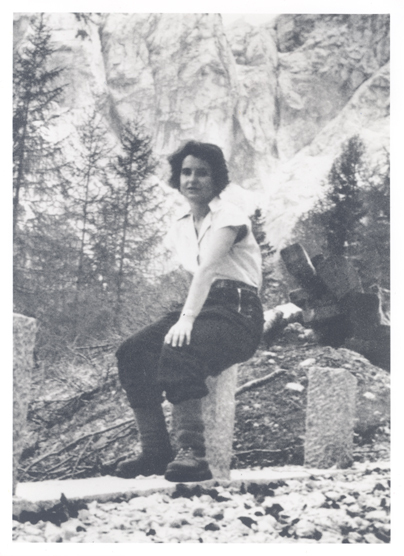 Rosalind Franklin was the best x-ray crystallographer. She was able to take very clear pictures of crystallized molecules. Picture 51 of Rosalind’s gave Watson an image that he recognized as a helical from his previous knowledge of the diffraction pattern given by a helical shapes. The picture provided mathematical information that was used to understand the width of the molecule and the height of the spaces between the zing and the sag of the helical shape. The picture also provided the diamond geometric spaces to determine the pattern of major and minor grooves within the molecule and the fact that is was a double helix by the missing information at helical crossover points on the layers of the smears. 6) After having been through the videos and the interactive, describe one thing that most impressed/surprised/enlightened you. I was most surprised by the woman, Rosalind. The pictures and stories of her life outside the lab, such as the hiking picture and the stories of her evening gowns and her upper class life were an interesting story to share with female students as we encourage them to become scientists. Pictures/Diagrams from Chapter 1 - Introduction to Genetics. 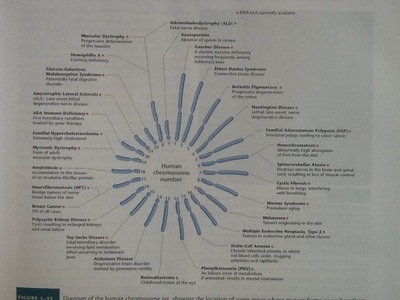 In order: Hereditary diseases on human chromosomes, gene cloning, gene expression, homunculus, and model organisms. My homework was to answer these questions: This was the introductory chapter so I answered them by myself before reading first, then read and compared my answers and tweaked them just a little. Nothing new for me in this chapter. It should be nothing new for you either. Please read the questions below. See if you can answer the questions before reading my answers. 1. Describe Mendel’s conclusions about how traits are passed from generation to generation. Mendel concluded there was a hereditary factor in cells that was being passed down from generation to generation. He did a series of tests and collected date on pea plants for ten years that showed that these hereditary factors were in fact passed down from generation to generation in the sperm and egg of organism. He is responsible for the Law of Segregation and the Law of Independent Assortment. 2. What is the chromosome theory of inheritance, and how is it related to Mendel’s findings? The chromosome theory of inheritance has to do with these hereditary factors that are located on the chromosomes. These hereditary factors are inherited by the offspring in the gametes. The homologous pairs of these chromosomes separate during meiosis. Mendel’s theory applied to most situations, but there are other patterns of inheritance. 3. Define genotype and phenotype, and describe how they are related. Genotype is the genetic code for a trait. It is carried on chromosomes as a set of alleles. Phenotype is the physical characteristic (the observable feature) produced by this genotype. 4. What are alleles? Is it possible for more than two alleles of a gene to exist? Alleles are alternate forms of a gene that code for a trait. Yes, it is possible to have multiple alleles. 5. Contrast chromosomes and genes. A chromosome has an arrangement of nucleotides that are the code for many genes that code for genetic traits (proteins). A gene is one set of directions coding for a protein. 6. How is genetic information encoded in a DNA molecule? 7. 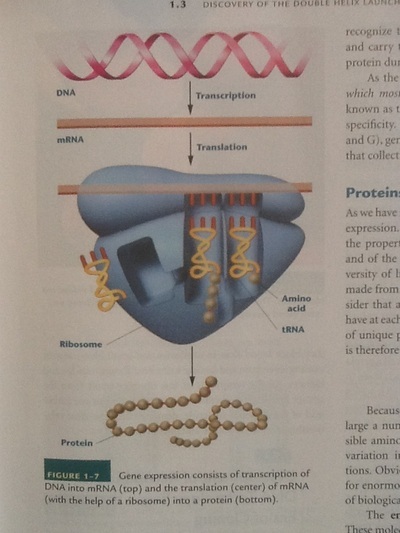 Describe the central dogma of molecular genetics and how it serves as the basis of modern genetics. DNA is the central dogma of molecular genetics. DNA codes for mRNA through transcription and translation which produces a series of amino acids with the use of tRNA which code for a particular protein which produces a particular protein needed by an organism via the ribosome. 8. How many different proteins, each composed of 5 amino acids, can be constructed using the 20 different amino acids found in proteins? 9. 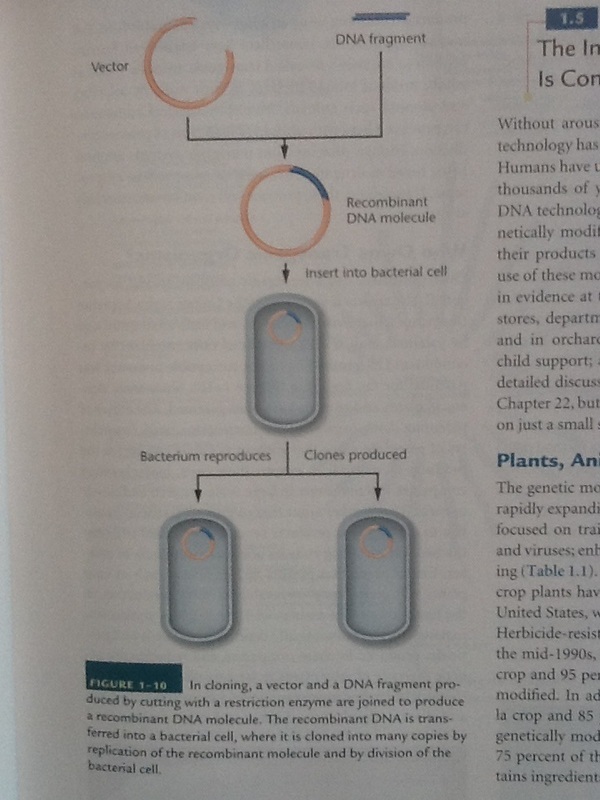 Outline the roles played by restriction enzymes and vectors in cloning DNA. Restriction enzymes cut the vector plasmid DNA and gene of interest DNA in the same position at the same nucleotide sequence. This allows the gene of interest to be inserted into the vector to be inserted into the host bacteria and used to copy that gene repeatedly. 10. How has biotechnology changed agriculture in the United States? Biotechnology is used in agriculture to selectively grow healthier plants that are disease (virus) resistant, vitamin fortified (golden rice), and temperature resistant. It has also been used to produce plants that are herbicide resistant, insect resistant, and have altered oil content. Delayed ripening is can also be achieved with biotechnological applications. 11. DNA microarrays or DNA chips are commercially available diagnostic tools used to test gene expression. How might such chips be applied to human medicine? Patients can be tested to see if they have the mRNA coding for certain hereditary, disease-causing genes. The DNA for these disease-causing genes are in the array. Complementary binding from a patient means the patient has the gene. The level of color determines the level of the match of the nucleotides. This can be used to inform potential parents to help make decisions concerning childbearing and also gene therapy. 12. 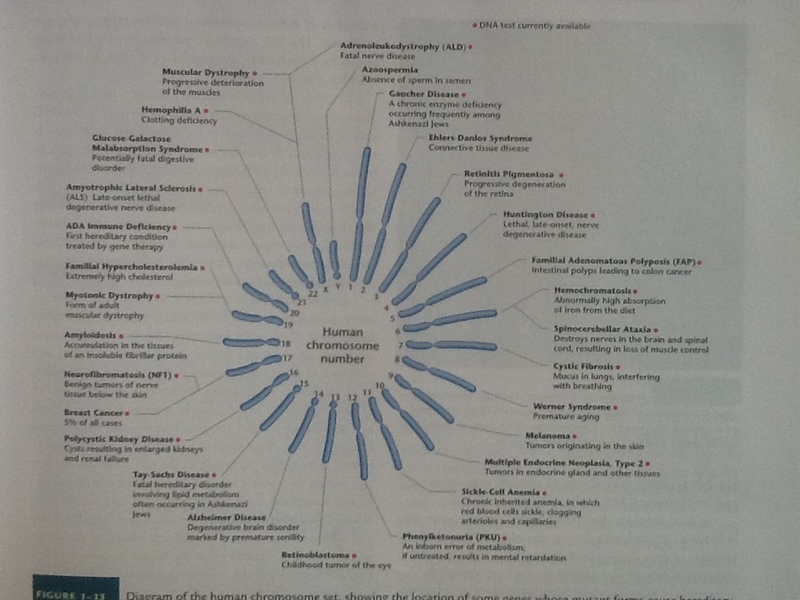 In what ways is the discipline called genomics similar to proteomics? Genomics is the study of the genome. It includes the sequencing of genes. Proteomics uses the sequencing of genes to study the combination of amino acids that produce the particular proteins and their structure and function within the cell. 13. Summarize the arguments for and against patenting genetically modified organisms. For: This is a consumer product that is the basis for business and without a patent, they would not be able to recover their costs for research and development. Against: Patenting would limit the number of companies available for farmers to purchase these products. 14. We all carry 20,000 to 25,000 genes in our genome. So far, patents have been issued for more than 6000 of these genes. Do you think that companies or individuals should be able to patent human genes? Why or why not?No. If others are allowed to use findings, further advancements can happen more quickly with those genes. 15. How have model organisms advanced our knowledge of genes that control human disease? They have few genes. They reproduce quickly. These traits allow researchers the ability to see the effects of manipulation of those genes more easily. Since we have a common ancestor, there is similarity in the structure and function of the genes of the model organism as compared to ours.